Dining Room Décor today will focus on minimalistic style! Let’s find out the lighting pieces that are going to be our main focus! BE INSPIRED: BLACK AND WHITE LIGHTING DESIGN TO MATCH IT UP YOUR HOME! Let us establish our focus on Ike Ceiling Lamp, with it’s multiple pipes that are able to create the perfect illumination for your Dining Room Décor. Ike has all there, the lighting, the design, everything. The simplicity in one picture. Handmade by the best skilled artisans that do every single lighting piece with much love and passion for their work. With its clean lines, this dazzling lamp is handmade in brass and aluminum. Now the Floor Lighting, Armstrong was the choosen one! 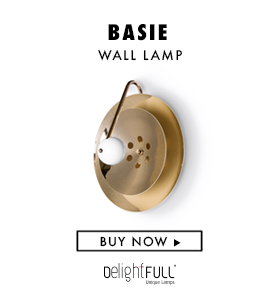 This lighting piece has all the characteristics to complete your home décor easily. It can be customized, just like all others, that is why it can be easier. This Nordic light combines a mid-century design with a structure handmade in brass and a base in white Carrara marble. Classic, elegant and with a touch of James Bond style, Coltrane Wall Lamp ends our journey the best way. It’s simplicity and modern design makes him a number one choice for your Dining Room. He can make the difference with it’s presence! Once again music and lighting can make a distinctive decoration. We know that it’s not very usual to have wall lighting in your dining room, but we dare you to be bold and to make something else away from the normal things. SEE MORE: DINING ROOM LIGHTING: COLOUR UP YOUR PLACE!